One Acre Fund, a Kenya-based nonprofit that helps farmers grow themselves out of poverty, trains people to get the most out of their tiny patches of land and gives them access to high-quality seed and fertilizer. It does quiet work. 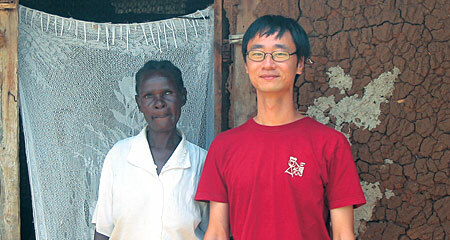 But once in a while, said founder Andrew Youn '06, it has to rescue a staffer from a riot zone. In January, mobs took to Kenya's streets to protest the results of the December presidential election. One Acre staff member, John, was traveling when the violence erupted. Meanwhile, his wife, Eva, was hiding in their home with the couple's newborn son, hoping the gunshots and rioters wouldn't find her. On hearing that Eva was stranded, One Acre Fund acted quickly, organizing a rescue team that reunited Eva and her son with John. "It was a wonderful moment of unity for all our staff," said Youn, adding that John and Eva were both "safely and happily back to work" less than one month after being separated. Since its 2006 inception, One Acre Fund has received several grants, including from the Echoing Green and Draper Richards Foundations, the Yale Entrepreneurial Society, SC Johnson, and the Kellogg School's Larry and Carol Levy Institute for Entrepreneurial Practice. Youn said the political turmoil has barely slowed One Acre's dedicated staff and hard-working farm families. In September, the nonprofit expanded into Rwanda with a pilot program, and the 40 participating families have already enjoyed their first One Acre Fund harvest, which brought in four times more food than their last. Said Youn, "We have had several skeptical Rwandese government officials come by to independently validate our work, and they have quickly turned into friends."